Flickr/FunkyBuddhaBrewFunky Buddha is known as one of the best craft brewers in the US. Another beloved craft brewer has been acquired by a beer industry giant. On Thursday, Constellation Brands — the parent company of Corona and Modelo — announced its acquisition of craft brewery Funky Buddha. 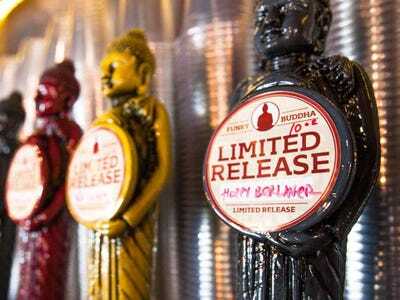 Funky Buddha is the fastest-growing craft brewery in Florida, winning over beer fans with brews like the Florida Hefeweizen and Hop Gun IPA. The brewer was founded in 2010, in Boca Raton, Florida. Funky Buddha’s acquisition by the third-largest beer company in the US, with Constellation racking in $US7.3 billion in sales in 2016, is a controversial decision in craft beer circles. Many fans of Funky Buddha spoke out against the deal on social media. Some people pushed back against the backlash. Beer industry giants have made serious investments in craft beer over the last few years. AB InBev, the parent company of Budweiser and the largest beer company in the US, has made deals with craft brewers including Goose Island, Blue Point, and Wicked Weed. No. 2 MillerCoors has acquired brewers such as Revolver Brewing, Hop Valley Brewing Company, and Terrapin. And, Constellation made headlines when it acquired Ballast Point in 2015. “Adding a fantastic regional brand such as Funky Buddha to our craft beer portfolio, along with Ballast Point, advances our strategy in continuing to lead the high-end beer segment,” Paul Hetterich, the president of Constellation’s beer division, said in a statement. Another one bites the dust – Funky Buddha brewery bought by Constellation Brands. As in every sale: good for the folks at Funky Buddha. They took all the risk and it paid. Doesn’t mean you have to buy it anymore. Good for the owners. I go to funky Buddha all the time when I’m in FL and I’d love to see wider distribution of hop gun, last snow, etc.